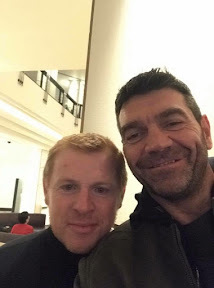 NEIL Lennon went over to the dark side quite literally after spotting Darth Vader actor Spencer Wilding at a Glasgow hotel. The Hibs manager was hanging out at Glasgow's Hilton hotel when he decided to introduce himself to Star Wars actor and former British Welsh kickboxing champion Spencer and his wee pal Jimmy Vee who plays R2D2. The two actors were in Glasgow for a Comic Convention at the city's Barrowlands and were chilling out before meeting fans in Saturday and Sunday. Neil, whose team drew against Morton in a controversial decision on Saturday appeared to seek some enlightenment from the dynamic duo. Glasgow born Jimmy Vee said: "We were at Spencer's hotel in Glasgow when Neil Lennon, who was with some of his friends, came over to us and asked I'd we would get our picture taken with him. It turns out he know some people who Spencer knows Liverpool way and he was quite keen to say hello. I don't follow football at all and never have. I'm more into motors and bikes and fast things but it was nice to see him." This week sees the fortieth anniversary of Star Wars.